This recipe came to me as I was thinking of ways to downsize my grocery bill. If you found this recipe through my Meal Planning 101- Week 1 page, then you'll understand just how affordable it can be to create such dynamite dishes such as this one. 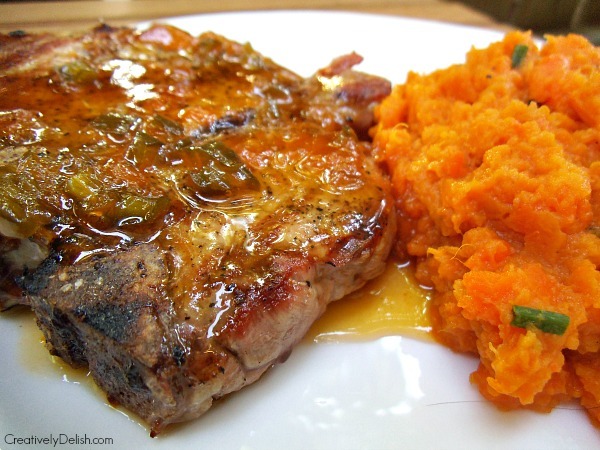 The sauce was three simple ingredients, pineapple juice, apricot preserves and a seeded and chopped jalapeno. Mixed with the simple salt and pepper on the pork, this sauce was the perfect compliment. Not too sweet, not too spicy, juuuuust right. I chose to make a family favorite as a side, Smashed Carrot & Sweet Potatoes. Seasoned with salt, pepper, butter and freshly chopped chives, they are even great served the next day as patties for breakfast or a quick snack mid-afternoon. I hope you enjoy - we sure did! 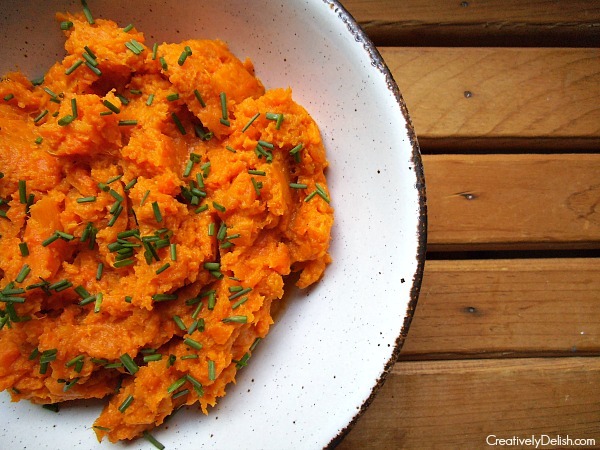 Carrot-Sweet Potato Mash on the side: 4 carrots + 2 small sweet potatoes, peeled and cut into smaller pieces. Season the pork chops with salt and pepper on both sides and place on the grill for 5-8 minutes on each side, depending on thickness. Be sure not to move the chops around too much so you get those good grill marks! While the chops grill, make the sauce. In a saucepan over medium heat, bring the preserves, pineapple and jalapeno to a boil, then let it simmer until the chops are ready. Stir occasionally and be careful because this heats up very quickly and can burn. 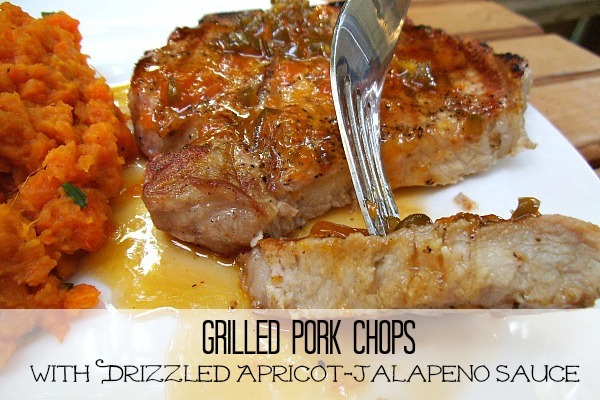 Drizzle the sauce over the finished pork chop and enjoy! To make the mash, boil the carrots and potatoes until soft, then mash together. Flavor them with salt, pepper, butter, chopped chives, creme fraishe...whatever! Store any leftover sauce in the fridge for up to 4 days. This looks so good! I love those sweet potatoes!